A German shorthaired pointer is known for its hunting ability. Nutrition is the cornerstone of an active, healthy dog, and it has a profound impact on a German shorthaired pointer’s performance in the field, according to veterinarian Chris Pinney. While some dog owners like the idea of making their pet's food from scratch, high-quality commercial-brand dog foods are a better choice since they are nutritionally complete and balanced. From birth to 14 months, feed your German shorthaired pointer top-grade commercial puppy formula to ensure proper growth. Many companies that specialize in formulating dog foods have precisely blended ingredients to provide optimal amounts of calories, protein, calcium, phosphorous and vitamins. The first year of your German shorthaired pointer’s life sets the stage for its health and happiness in later years. Generally, supplementation is not necessary if you’re feeding your puppy a high-quality food. Follow the package directions to determine the daily ration, and feed half of it in the morning and half in the evening. Allow your puppy to eat all it wishes for 20 minutes, and then remove the food from its reach until the next meal. Your puppy will quickly learn the good habit of eating on schedule. Refrain from feeding it table scraps and treats between meals to avoid upsetting the nutritional balance, but let it chew on a nylon bone to satisfy a puppy’s craving to chew. Replenish fresh, filtered water daily, and wash the bowl at least once a week. After 14 months, switch your pointer to an adult maintenance formula in the same brand for the smoothest transition. Some companies make a single formula for all stages of life, but they’re usually targeted for puppies and are too rich for adult dogs. 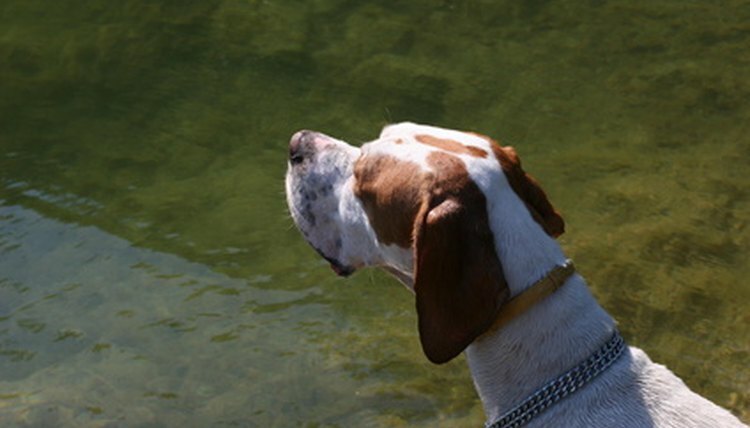 Continue to feed two smaller meals per day rather than one large one, since German shorthair pointers are prone to bloating, which can be a dangerous medical condition. To help ensure the best life possible for your dog, be zealous about keeping its weight at a healthy level, but don’t underfeed it, either. The standard for small males is 55 pounds, while large ones can weigh up to 70 pounds. The standard for females is 45 to 60 pounds, depending on body type. More than 10 percent over that weight is considered obese. During field training or if you go hunting with your German shorthaired pointer, it will need 35 to 40 percent more calories. Choose a nutritionally dense food that is higher in fat than your dog's regular food. Feed 25 percent of the daily ration two hours before training or hunting, and the rest of it an hour afterward. Never feed an hour or less before rigorous activity because of the tendency to bloat. Once hunting season is over, switch back to the dog’s regular feeding routine. Reserve treats for training sessions. Some German shorthaired pointers enjoy avocados, and you can offer a couple of bite-sized pieces occasionally between meals if you choose. The breed generally doesn’t need dietary variety to satisfy its cravings, and they can become finicky eaters and learn to crave treats if they’re frequently given things other than their regular diet. Do not feed it bones -- ever, according to Pinney. Not only can they shatter, splinter or become lodged in the throat and gastrointestinal tract, but they create nutritional imbalances because of the many minerals in bone. Flavored nylon chew bones are fine, however. Even large chunks of them are easily digested by the pointer’s digestive system. The feeding of bones is disputed among animal experts. Some believe it is vital; others believe it is dangerous. Switch to a senior formula when your dog reaches 7 years old to provide the highest nutrition possible while keeping weight at an optimal level. These formulas usually include more fiber and less fat and the balance often helps slow the progression of disease. Your dog’s ability to taste and smell may diminish as it ages, so increasing the taste of the formula may be necessary. Warming canned food might help, as will stirring in a bit of water with dry food or adding flavor enhancers recommended by your veterinarian.